"The year was particularly strong for alternatively-fuelled vehicles as increased choice, coupled with a growing desire for reduced costs and greater efficiency, resulted in a quadrupling of plug-in car registrations over 2013," explained SMMT chief executive Mike Hawes. "With a variety of new plug-in models expected in 2015, this area of the market will continue to grow significantly," added Hawes. "For the market as a whole, we expect a more stable 2015 as demand levels off." At the start of 2014, Deputy Prime Minister Nick Clegg unveiled Go Ultra Low, a £2.5m campaign encouraging UK motorists to adopt ultra low emission vehicles. 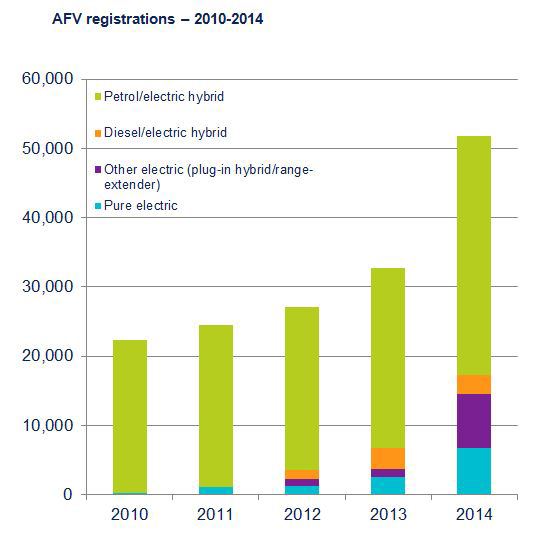 Sales of plug-in cars have since increased from 3,586 in 2013 to 14,498 in 2014. There are now more than 20 plug-in models available to buy compared with just six in 2011, with each of the 10 best-selling brands in the UK now having a ULEV in its range. Clegg said: "The extremely low running costs of these cars help drivers save money. Electric cars are one of the most promising of our green industries and we want to secure the UK's position as a global leader in both the production and adoption of these vehicles." The Government aims for ULEVs to account for every new vehicle on the road by 2040. As such, it will invest £500m between 2015 and 2020 to boost the ultra-low emission vehicle industry even further and help drivers 'both afford and feel confident using electric cars'. In related news, Japanese carmaker Toyota this week announced it will freely share all of its hydrogen fuel cell technology in order to spur development of low-emission cars around the world. Elon Musk's Tesla Motors took a similar step in making its patents available to other carmakers late last year. To mark a year which will bring high quality, high-tech, low-emission transport systems to the UK, edie has delved into six sustainable transport ideas that take us beyond the internal combustion engine and into the 21st century. Read more here.